Ahmed Mohamed Silanyo, President of the Republic of Somaliland, issued an official statement on 9 November 2016 regarding a serious drought affecting the country. According to the most recent assessment, more than one million people are in need of humanitarian assistance, with hundreds of thousands facing acute food shortages. More than 80 percent of the families living in the areas most affected by the drought have lost most or all of their livestock, with the remaining stock being likely to perish as well should there be no intervention soon. In light of this situation, President Silanyo urges the international community to “act quickly to save lives and prevent a massive human tragedy from happening”. The Government of Somaliland is declaring the existence of serious drought conditions in the country. 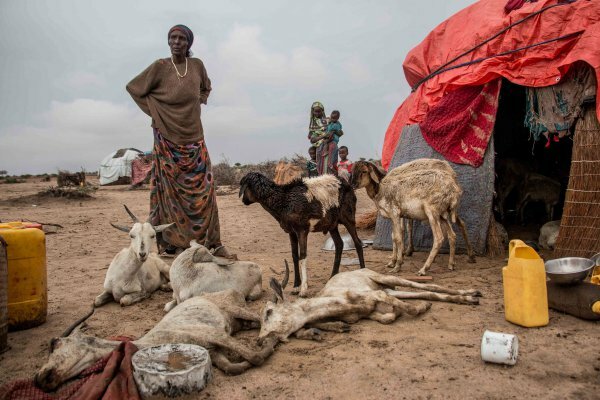 The El Nino phenomenon has had a devastating effect on Somaliland. For the past 2-3 years, the rains were well below average and sporadic in the regions of Sanaag, Sool, Togdheer and Sahil. According to the most recent seasonal assessment by the Food Security and Nutrition Analysis Unit (FSNAU) and the Famine Early Warning Systems Network (FEWSNET), more than one million people need humanitarian assistance, and nearly 248,000 are at risk and face acute food shortages in Somaliland. An inter-agency rapid needs assessment mission carried out in Somaliland in October-November in 19 districts by 13 teams and lead by OCCHA and NERAD found that 86% of the pastoralist families have lost livestock in the past season and that 51% of families eat less than three meals a day. Another assessment mission carried out by the Somaliland government in October-November which covered an extensive area in the Eastern and coastal regions found the situation there very critical. Up to 60% of sheep and goats and 20% of camels have been lost already. The remaining livestock is so weak and sick and have very little chance of survival without intervention. The situation is deteriorating by the day, and we are facing mass starvation and loss of lives on a grand scale unless immediate assistance is provided. The Government of Somaliland, therefore, appeals to the international community, the UN and humanitarian organizations, to provide urgent relief assistance to the drought affected people in Somaliland. While the drought is wide spread in Somaliland, the areas particularly hit hard are the eastern regions of Sanaag, Sool, Togdheer, and Sahil. Some districts in Awdal and Maroodi- Jeh regions are also affected. The current drought is one of the severest in the history of Somaliland affecting over one and half million people as a result of three back-to-back years (2014-2016) of failed rains. The people affected include displaced families (ID Ps) who lost their entire live stock to the drought. Malnutrition is wide spread in the affected areas. Failure of local food production, loss of livestock, reduced income and rising food prices have resulted in food shortages, loss of mobility, weight loss, and high mortality particularly among children and the elderly. More than 80% of the families in the hard hit areas have already lost most or all of their livestock, and the condition of the remaining stock is so poor that they don’t have much time to live without immediate intervention. The landscape and the migratory routes are littered with rotting livestock carcasses a testimony of the devastating effect of the drought. Income from livestock has declined significantly, and the purchasing power of livestock owners deteriorated. As a result many of them turned to charcoal production to feed their families contributing to the destruction of an already fragile environment. In light of the emergency situation described above, and on behalf of myself, my government and people of Somaliland, I urge the international community to act quickly to save lives and prevent a massive human tragedy from happening.